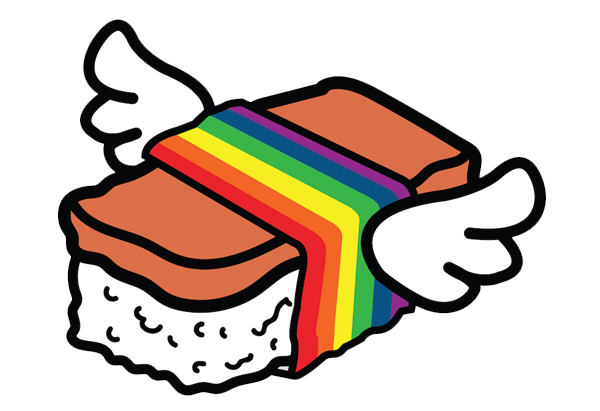 Please note: Honolulu Pride™ Parade is a free event for all who want to participate. No one will be charged any fees by the Hawaii LGBT Legacy Foundation although donations are fine and greatly appreciated. The 2018 Honolulu Pride™ Festival was an amazing day of celebration, entertainment, friendship and love attended by more than 5,000 revelers. Mahalo to Kelli Bullock / Kelli With An Eye Photography and Trenton Kakazu / Freak Photography for the nice pics! Mahalo to Walter Enriquez / Gay Island Guide for organizing this year’s festival entertainment. Scroll down to see the line up of performers, and the list of sponsors and community groups that had booths at the festival. Special Guest Hosts and Emcees: Designer Andrew Christian and West Hollywood model and The Abbey bartender Cory Z.
Oli by kumu hula, chanter and Hawaiian cultural practitioner Brad Lum. GMCoH always surprises with their witty and passionate mix of musical styles. Jared & Friends will bring a little Country Music to this year’s festival; with Hawaii’s LGBT Country Line Dancing group. Drag and transgender entertainers come together for exciting performances celebrating Hawaii’s amazing local talent. The internationally renown, Emmy Award winning comedian, songwriter and actor tops off the first half of this year’s Festival entertainment. The daring Drag Queen from R Place in Seattle will leave you picking your jaw up off the ground! Young sweet lesbian military wife…and Top 10 American Idol finalist Jurnee brings it to Honolulu. Native Hawaiian Sasha Colby returns to Hawaii from West Hollywood after traveling the world to wow her island community. The American Idol finalist will bring the Honolulu Pride Festival to a resounding finale with her powerful vocal performance. Local favorite DJ TittaByte kicks off the beats at the Gay Island Guide Drink Oasis. Former Fusion Waikiki and now all-around Hawaii–including Scarlet Honolulu–DJ EmVee will have your body moving on the dance floor! From West Hollywood’s The Abbey, DJ Dawna returns to Honolulu for a special set at this year’s festival AND to kick it at the Official Honolulu Pride After Party at Hula’s. Taking a break from touring the major circuit parties internationally, DJ Jesus comes to Honolulu for the first time to close out the festival at the Gay Island Guide Drink Oasis. The Festival is an All Ages event; but anyone under 21 is prohibited from purchasing or consuming alcohol at the Festival. No pets are allowed at the Waikiki Shell / Diamond Head Greens including the Festival grounds. Exceptions are made for registered service animals. Strollers are allowed at the Festival. Wagons are not. 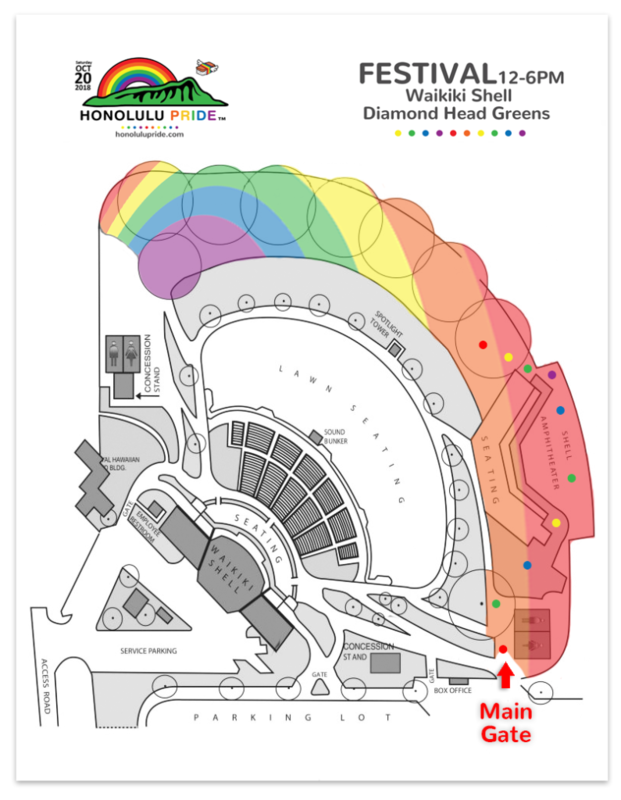 The Waikiki Shell and Diamond Head Greens are ADA compliant, however the Festival grounds are unpaved and can be uneven. Only one small bag (12″ x 12″) is allowed per person. Footwear is required. No need removing them when entering. The following cannot be brought into the Festival: food, beverages, alcohol, coolers, ice chests, large bags, bottles, cans, weapons, drones, skateboards, bad attitudes. Hydro flasks and similar containers must be empty and cannot be used on the festival grounds. Exceptions are made for baby formulas and special needs. Smoking, including e-cigarettes, is prohibited except in designated areas. Royal Hawaiian Hot Dog Co.